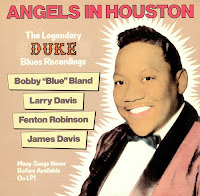 Angels in Houston: The Legendary Duke Blues Recordings (Rounder) - This release has only been issued on LP and cassette. I picked up the cassette in the late 80's. The main reason I picked it up was because I had bought a cassette on Black Top Records by James "Thunderbird" Davis and liked it so much that I wanted to hear more from him. 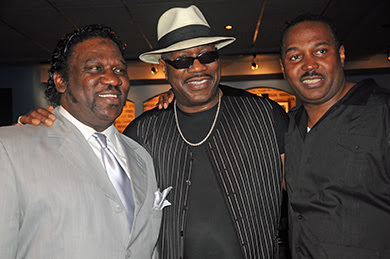 In the process, I got to hear some other fantastic artists that I liked even more......Fenton Robinson and Larry Davis. I was already familiar with the great Bobby "Blue" Bland and he gets four songs on here, all from his peak years and all of which are familiar to most blues fans, including the incredible "Yield Not To Temptation." 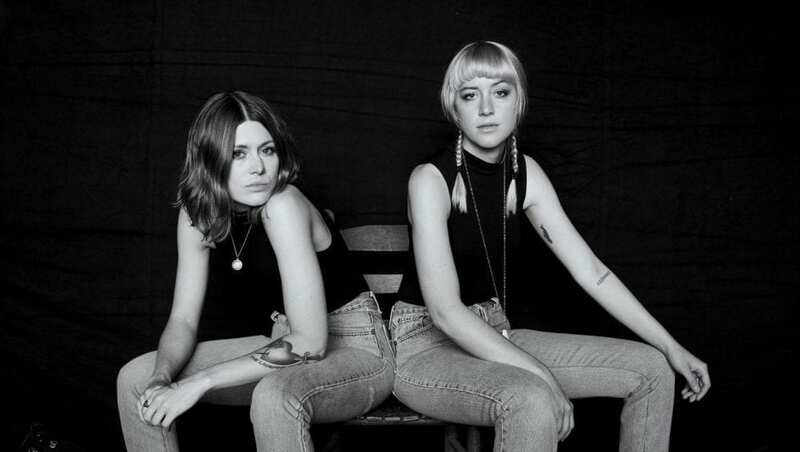 The two Davises get three songs apiece, including James Davis' "Blue Monday" and "Your Turn To Cry," and Larry Davis' "Texas Flood" and the title track. Fenton Robinson has long been underappreciated, which is a shame. He was an immensely talented singer, composer, and guitarist. He gets four songs, including "As The Years Go Passing By" and "Tennessee Woman." These were considered "rare" recordings at the time, as most had never even been on LP before. Now they are fairly easy to find, thanks to the internet, but this collection is pretty special by itself and it's never been available on CD. Since all of Duke's catalog belongs to another label now (MCA or whatever they're called now....Universal? ), it's highly unlikely that this particular collection will ever see the light of day on CD. Too bad, but at least they're still available for listening on other collections. 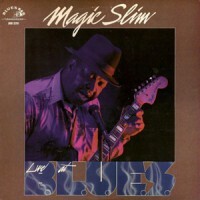 Magic Slim - Live at B.L.U.E.S. (B.L.U.E.S. R&B) - This was the first Magic Slim recording that I ever owned and it's one of the best he's ever done. It was recorded at B.L.U.E.S. in Chicago and Slim was in really fine form that night, as was this particular incarnation of the band (John Primer - guitar, Nick Holt - bass, Nate Applewhite - drums). The coolest thing about this recording is that the set list includes some of Slim's less familiar songs from his vast catalog, such as "Luv Somebody," "Poor Man But A Good Man," "Gambler's Blues," "Keep a Drivin'," and "Help Yourself." The only tune that might be familar to some Magic Slim fans is a long-play version of "Mother Fuyer." I keep hearing rumors that this one will eventually make it to CD, but I've been hearing them for nearly ten years. If it ever does make it, you must give it a listen. You will thank me later. 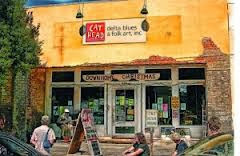 The Down Home Guide To The Blues - by Frank Scott and the Down Home Music Staff (A Capella Books): One of the best of the mail order catalogs for blues recordings was Down Home Music. They specialized in those hard-to-find recordings and had them for a very nice price most of the time. Their monthly catalog was indispensible because nearly each item came with accompanying review written by Scott or one of his staff members. Best thing about those reviews was that if it was worth having, they would tell you it was worth having, and if it wasn't, they would tell you it wasn't. 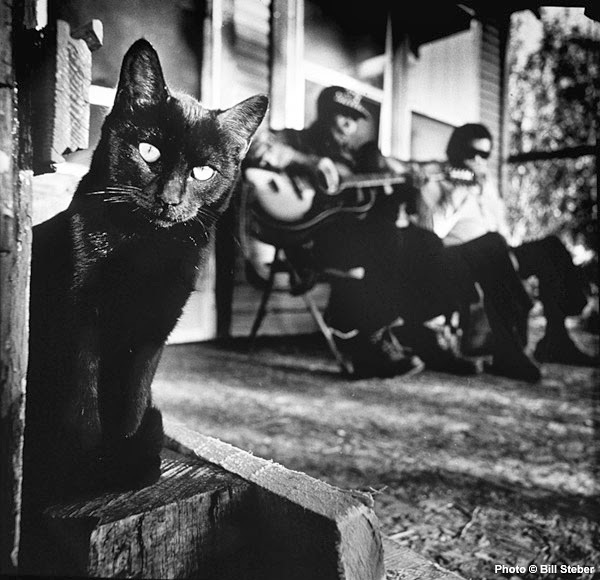 It covered about 3,500 recordings ranging from the pre-war country blues of the 20's and 30's, all the way through the early 90's (which was when it was published). 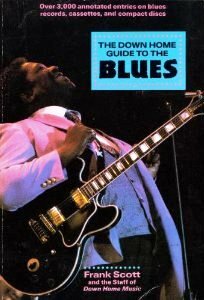 Of all the books I have on the blues, I've probably looked at this one the most, at least a few times a week, until it came up missing some time back, during our house remodel event last year. Hopefully, it will turn up again soon because it's still a great source of information about a lot of blues artists and recordings. 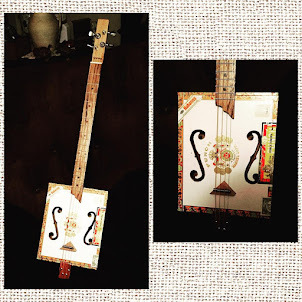 Down Home Music is still going strong today and have their own website, so stop by and see what you're missing. The Listener's Guide To The Blues, by Peter Guralnick (Facts on File): I first heard about this book in an issue of Guitar World, their annual blues issue. There was an article about essential recordings, publications, and video (no websites or DVD way back then). Guralnick's book was listed among the essential publications. This is the only Guralnick book that I was never able to find in print. 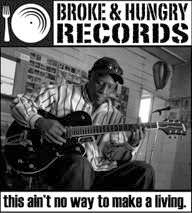 I may have to order it online, but it's similar to the Down Home Music book in that it covers artists and recordings....the difference being, from what I've heard, that it takes you through the blues as if you're a newcomer and starts you from scratch. I'm such a fan of Guralnick's work that I know it has to be as good as the rest of his books. There you have it.....one man's blues wish list. Anyone who's ever collected any type of music over an extended period has a wish list, whether they're aware of it or not. What's on your wish list? 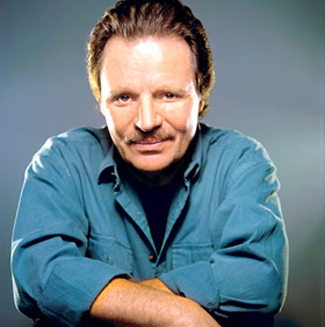 Happy belated birthday to one of my longtime favorites, the Texas Roadhouse King, Delbert McClinton. He turned 71 last week. 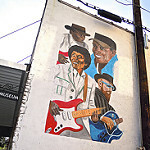 McClinton's music fits many genres, including rock, soul, and country, but his roots are firmly planted in the blues, the music he grew up around as a youngster in Fort Worth. In addition to his vocal talents, he remains one of the best harmonica players around. If you've never seen him perform, you need to make a point to check him out next time he's in your neighborhood. 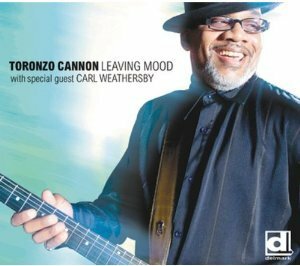 How about a couple of mini-reviews......I received a copy of Chicago guitarist Toronzo Campbell's new release for Delmark Records, called Leaving Mood. It's been in my stereo since yesterday and might be there for a while. Wow! From what I understand, this guy has played in a couple of bands around Chicago (Wayne Baker Brooks, Joanna Connor) before forming his own band, the Cannonball Express. From listening to Leavin' Mood, he learned well. He's an outstanding guitarist and singer, mixing the blues and soul with a dash of rock and even some 70's era R&B. Even better, he's writes his own songs and they are clever and distinctive, touching on familiar subjects but with a fresh coat of paint. Standout tracks include the opener, "She Loved Me," a third cousin of Hound Dog Taylor's "She's Gone," "Chicago's Song," "Hard Luck," with Carl Weathersby playing some blistering guitar, the title track, and "She's Too Much." Delmark has really done a good job in recent years recording many of the younger Windy City performers and this one is one of their best recent releases. Shane Dwight moved to the Nashville area from California several years ago with mixed results. The good results involved getting good management, associating with some great musicians, and signing with a record label. The bad side was seeing his marriage come to an end. Most musicians thrive on adversity...often the best songs come from living the worst times. 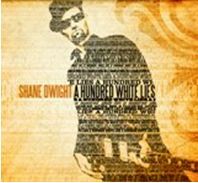 Dwight's latest release, A Hundred White Lies, lays bare his soul as he pull no punches, either with himself or with others. His songs mix blues, rock, and country rhythms seamlessly. 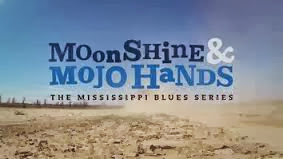 Lending Dwight a hand are several members of Delbert McClinton's band, including Kevin McKendree, who produced the disc and played keyboards and guitars, and Nashville blues guitarist Mike Henderson and singer Bekka Bramlett. If you're not familiar with Dwight (he's played with such luminaries as B. B. King, Johnny Winter, Jimmie Vaughan, Los Lobos, and Los Lonely Boys), you should be. He's the real deal.